Dr Bourlakis and Dr Weightman teach and research at the School of Agriculture, Food and Rural Development, University of Newcastle upon Tyne, UK. 1. Introduction to the UK Food Supply Chain: M. Bourlakis and P. Weightman. 2. The Food Consumer and the Supply Chain: D. Marshall. 3. Perceived Risk and Product Safety in the Food Supply Chain: M. Brennan and S. Kuznesof. 4. Procurement in the Food and Drink Industry in the Early 21st Century: J. Allinson. 5. The UK Livestock System: D. Harvey. 6. UK Crop Production: S. Wilcockson. 7. Food Manufacturing: D. Hughes. 8. Food Retail, Wholesaling and Catering: J. Dawson. 9. Partnerships and Alliances in UK Supermarket Supply Networks: R. Duffy and A. Fearne. 10. New Product Development and Information Technology in Food Supply Chain Management: The Case of Tesco: M. Francis. 11. Third Party Logistics in the Food Supply Chain: A. C. McKinnon. 12. Temperature Controlled Supply Chains: D. Smith and L. Sparks. 13. Factors Influencing Supply and Demand for Organic Foods: G. Butler, H. Newton, M. Bourlakis and C. Leifert. 14. The US Food Supply Chain: J. R. Stock. 15. The Future of the Food Supply Chain Management: C. Bourlakis and M. Bourlakis. 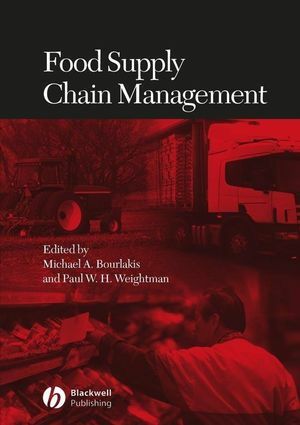 …one of those titles you really should have read as a professional operating in the supply chain and associated food industry...it is surprising that no authoritative text already covers the food supply chain. The book is clearly laid out stepping through a series of chapters, each of which is well referenced to allow the reader to explore any particular area more deeply. For anyone wishing to understand the food supply chain, the chapters on livestock systems and crop production are essential. This is a good all round text, that is accessible and genuinely covers all aspects of the food supply chain… and should be considered an essential read by any supply chain professional. A vital guide to those supplying the food industry. Contains important information for students undertaking food studies courses. Well-known editors and contributing authors.